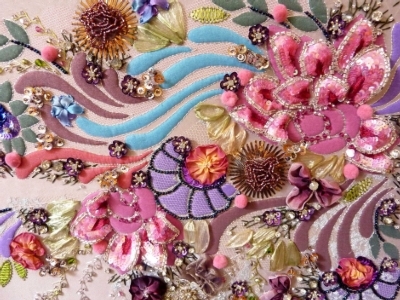 Karen Torrisi has been designing & creating luxurious, exquisite beading & embroideries professionally since 1994, a career spanning over 2 decades. She currently works in London UK & Paris France. Karen's formal training began in Sydney Australia in Fashion. She then pursued the specialized study of beading in Aust, with the late beading author Maisie Jarratt. She continued her training at Ecole D' Broderie d'art Lesage in Paris, receiving a Queens Trust Grant for Young Achievers to study Haute Couture Beading and Embroidery to professional level in Paris in 1999. To further her advanced embroidery skills, she has attended courses at the Royal School of Needlework at Hampton Court in the UK. Opening her own atelier in Sydney Australia in 1994, Karen designed beading & embroidery for many designers & couturiers, coordinated beading for a team of local embroiderers and then coordinating beading production in India & China. Karen has been teaching Tambour Beading and Hand Embroidery since 2000. She currently teaches other enthusiasts these skills at govt. institutions, for the Embroiderers Guild, privately & at Art & Stitch Symposiums around the world. She won 1st Prize (Open Category) in the Hand & Lock Embroidery Prize. This is an internationally prestigious embroidery prize. Star Wars II Attack of the Clones Star Wars III, Revenge of the Sith & Superman 2006. Aladdin Hamburg & London, Lion King, Sunset Boulevard, Chicago, Show Boat, My Fair Lady, Miss Saigon, Phantom of the Opera, Mamma Mia, The Lion King, The Producers, Spamalot, Wicked, Mary Poppins & Love Never Dies. Chanel, YSL & Celine Haute Couture & RTW Paris. Ralph & Russo Haute Couture London. Opening Ceremony Gown for Olivia Newton John 2000 Sydney Olympic games. Singer: Delta Goodram 2004 Aria awards & 2005 World Music Awards. Karen now beads exclusively for selected designers & costumiers.